Second outing from Huebner (American by Blood, 2000) is pitched as a fictionalized version of the author’s relationship with his Gulf War veteran brother. Sergeant E-5 Smith Huebner is trained to shoot the big gun in an M-1 A-1 Heavy Armor tank. He can kill with his hands or his weapon, and he knows that “the same firepower that guarded his life could kill him in an instant.” When he arrives with his group in Kuwait, tensions rise in an encounter with some Bedouins, but it will be a while before the war begins—and at least a month before anyone gets used to the heat. Back in the States, meanwhile, younger brother Sam, whom Smith had taught to smoke pot and who’s moved to New York to struggle as a writer, begins protesting the war and cultivating a drug habit. And Smith’s wife turns up pregnant. Smith is thrilled, but all he can do is document the army equipment and stare out into the desert. When the war finally begins, there’s no small amount of patriotic fanfare as a CO walks past the troops to ask what they’re fighting for and “the names, places and pledges filled the air.” Good thing, too, for it’s not long before Smith is putting tank shells through the chests of Iraqi officers. His crew feels bad about this, sure, but they’ll be fine, the reasoning goes, as long as they imagine themselves as the De Niro character in The Deer Hunter. Huebner (the author) has the banter of tank battles down and doesn’t approach war entirely without irony, but the very excitement of some sequences here feels celebratory. At end, Johnny comes marching home, and if there’s tension between the soldier and his peacenik brother it soon evaporates, and peace settles softly over the republic. 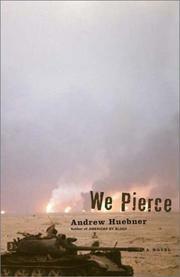 A well-written, surprisingly straightforward account of a not-so-straightforward war.